Director George Lucas is one of the most famous filmmakers in the world due to the enormous success of his Star Wars series of films. Starting with the original film, STAR WARS: A NEW HOPE, Lucas has done much to change the game, when it comes to blockbuster films and the selling of licensed merchandise. Even three decades after the original film, the marketplace for Star Wars collectibles should be considered an economy onto itself. George Lucas the marketer and business is obviously one of the titans of industry. However, what about George Lucas the film director? Should we consider him to be a visionary filmmaker or is crass hack, only interested in the bottom line? George Lucas is a visionary with a single-minded focus: doing it his way (actually, I like to think George did it MY way… play with cool toys, tell fun stories, make a shitload of money…it’s just that he has actually done it). The man from Modesto may have taken another career path and perhaps become a professor of anthropology at some community college, but instead he fell in love with film making and the rest is literally Hollywood history.A big-time car buff, Lucas used that to his advantage, putting hot rods front and center in his breakout film, AMERICAN GRAFFITI (which gained 5 Academy Award nominations). This success put him on the map enough for Fox Studios to reluctantly greenlight STAR WARS. He famously waived his upfront directing fee on that film in favor of owning all of the merchandise rights, which taught the studios a lesson they’ll never forget.Said George: “I took over control of the merchandising not because I thought it was going to make me rich, but because I wanted to control it. I wanted to make a stand for social, safety, and quality reasons. I didn’t want someone using the name ‘Star Wars’ on a piece of junk.” (quote from IMDB: http://www.imdb.com/name/nm0000184/bio#quotes)Interesting how it actually turned out: he did get rich, and they do put the name on a lot of junk. But that’s okay, the record-setting success of STAR WARS was just the start of something much bigger than one man. Lucas is directly or indirectly responsible for THX, INDUSTRIAL LIGHT & MAGIC, SKYWALKER SOUND and PIXAR, all companies that have positively pushed the state of the particular art that they create. These innovative production firms have made possible many wonderful cinematic moments. All because Lucas wanted to do things his way… and he did.Lucas is a visionary, though he does sometimes veer dangerously close to the edge of hack with his creative choices. But from a big picture perspective… and Lucas is nothing if not King of the the Big Picture… the Maestro of Marin remains golden. 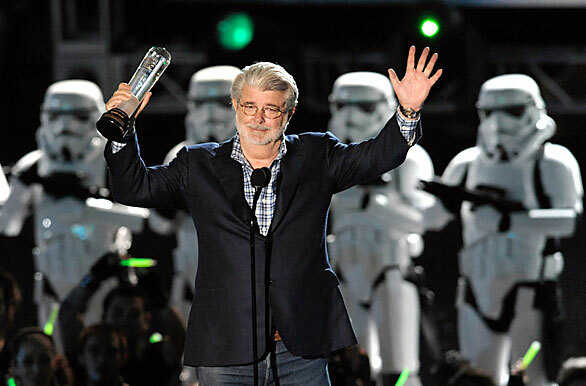 Producer, director and writer George Lucas is a visionary entrepreneur – not a visionary filmmaker. Star Wars may be regarded as his most distinctive achievement in filmmaking, but Lucas’ influence on pop culture and film industry technologies is his true achievement. What is Lucas’ best film? Ironically, even though Star Wars maintains a fun, energetic pace to complement its eye-popping visuals, Lucas’ earlier efforts, THX-1138 and American Graffiti, highlight a strong sensibility for story, character and cinematic settings. This does not take away from Lucas numerous initiatives as film historian and preservationist, or his many achievements in developing technologies, which have advanced the movie-going experience for audiences everywhere – it just emphasizes his true focus as a visionary entrepreneur. After showing his vision in THX 1138, a science fiction film depicting the elites controlling the populace using drugs, and of course his “game-changing” epic Star Wars trilogy, Lucas become a true movie mogul and one of the most powerful men in the business. Nobody can argue against the fact that the success of Star Wars has made a lasting impact on both the art of filmmaking (for better and worse) and popular culture. So why am I so outrageously and brazenly labeling him a hack now? It is because what director once was is not the only thing that defines a director’s career. You must also take into account everything else that director has created during his liftetime. The BIG picture. And post Empire Strikes Back, that picture turns ugly in a hurry.The ability to make action figures and lightsaber toys do not make you a visionary; it is what you do as a movie director or in Lucas’ case, as writer/director. Star Wars Episodes 1 through 3 were some of the most brutally awful big budget films ever created, plagued by wooden dialogue, laughable plot lines and disappointing visual style. Only a Jedi in the dark arts of hackery (a Sith lord?) could turn charismatic actors such as Samuel L. Jackson, Liam Neeson, Ewen McGregor and Natalie Portmann into an army of wooden mannequins. Plus we should never forget that The Empire Strikes Back, considered by many as the best of the Star Wars movies, was neither written nor directed by Mr. Lucas, and the second best film, Stars Wars: A New Hope, was based on a story line lifted directly from the classic Akira Kurosawa film The Hidden Fortress. With such scant evidence of truly visionary filmmaking, the lack of truly great films on his filmography, and the abundance of really awful films on that same filmmography, my verdict can only be that Mr. Lucas must now be considered a hack, a man who makes bad movies to augment his already fabulous personal wealth. And if Rihanna can become a “Good Girl Gone Bad”, then the great George Lucas can create precedent by becoming the first example of a “Visonary Director Gone Hack”.